It was weird, having spent a career looking after men with prostate problems, to discover that my own PSA was raised to 4.3ng/mL. A 3 Tesla MRI with gadolinium enhancement revealed a lesion in the right peripheral zone, which a biopsy confirmed as a Gleason 3+4=7 adenocarcinoma. The decision wasn’t difficult for me: I opted for a robot-assisted radical prostatectomy (RARP), to be performed by the Editor-in-Chief of this journal, Professor Prokar Dasgupta, ably assisted by Ben Challacombe and Krishna Patil. Details of my whole journey are available here for those who are interested. The key point for discussion in this blog is the availability of the latest technology for the care of patients with prostate cancer who are less in the know than me. Shouldn’t we be lobbying for greater access for all to the latest pieces of high tech gear? 3 Tesla MRI imaging, together with the expertise to interpret the findings of diffusion-weighted images, for example, offers the possibility of a “prostate mammogram” which facilitates the targeting of the biopsy and holds the promise of avoiding biopsies in those in whom the MRI images appear blameless. Da Vinci robotic technology undoubtedly facilitates the surgical procedure, especially the preservation of the neurovascular bundles and the very precise vesico-urethral anastomosis. It certainly was an interesting experience to sit and watch the DVD of my own operation at home, with a catheter still draining my bladder, wondering about my future continence and sexual function, as well as the histopathology report! Am I discombobulated by this experience? Not especially, I genuinely found being on the receiving end of prostate surgery a truly educational experience and I now feel energised to help others get through their journey. In the upcoming issue of Trends in Urology three other of our urological colleagues share their own experiences of prostate cancer, as well as the lessons that can be learned from them. Check out the Trends in Urology website from mid-March onwards. In the meantime we would be interested in your own thoughts on these issues. Do add a comment or question to this blog. Many, including myself appreciate you coming forward by discussing openly regarding your personal fight against prostate cancer. I am sure not many will forget the speech of John Anderson at BAUS 2012 regarding his tryst with prostate cancer. Coming back to the main point you are hoping to highlight "Shouldn’t we be lobbying for greater access for all to the latest pieces of high tech gear?" This clearly shows that not all patients in the UK have easy access to Robotic Prostatectomy. There is a definite post-code lottery for this procedure. Despite the controversies regarding the functional and oncological outcomes, many of us who have converted from Open/Lap to Robotic approach clearly know the definite advantages that this technology can offer. The readers of the blog would be extremely pleased about your fantastic recovery but I would like to ask "they say, doctors make the worst patient, is that true?! On the other hand, I should be asking Professor Dasgupta that question!! Roger, thank you for sharing your experience. Your courage in coming forward publicly about your experience of being on the receiving end is an inspiration to all of us who are involved in the treatment of prostate cancer. Wishing you the very best for a complete recovery. Thanks to Roger for sharing his experience & making learning points from it. With the trend towards personalised management of healthcare, the newer more sophisticated imaging such as 3 Tesla MRI will be critical. Potentially both in treatment and screening roles. As expected Roger's brave blog has already attracted comments from colleagues. The photograph of our robotics team is rather nice, although I do not recollect Roger using his iPhone as soon as he woke up! Amrith - the bounds of patient confidentiality do not allow me to answer your question. BJU Int. 2012 Nov;110(10):1544-56. doi: 10.1111/j.1464-410X.2012.11015.x. Epub 2012 Mar 22. Assessing the cost effectiveness of robotics in urological surgery - a systematic review. Best of luck with your recovery Roger and thank you for telling the story. You have always been a leading voice for Men's Health in the UK and your current writing on this will help men feel more comfortable about discussing their health with their providers. As the writer of the article to which Roger refers and links (in the Economist's Intelligent Life magazine), and as the snapper of the team photograph, I also want to thank the patient for his honesty and bravery in letting a journalist tell his story. It was a privilege to observe the whole procedure with such a skilled and trusting group of people. Another potential learning point from Roger telling his story is that the diagnosis came from self-screening. It has always seemed logical to me that the well-informed want to remain well-informed and know the facts to hopefully make the right decision. Although we know that PSA is not ideal and that only the ERSPC showed a significant reduction of prostate cancer-specific mortality in a pre-specified subgroup of men aged 55 to 69 years. It would be an interesting BAUS survey to ask urologists over the age of 50 if they have self-screened with PSA testing and those under 50 if they plan to. In a time when the new measure for whether or not a hospital is good is informed opinion such as 'would you send your family there?' are we practising what we preach? Declan - I can't comment because of patient confidentiality! We were amazed to read that Professor Kirby has recently undergone a radical prostatectomy performed by Professor Dasgupta. We saw Professor Kirby for his advice just over l8 months ago, when we found out that my husband had Gleason 7 aggressive prostate cancer. 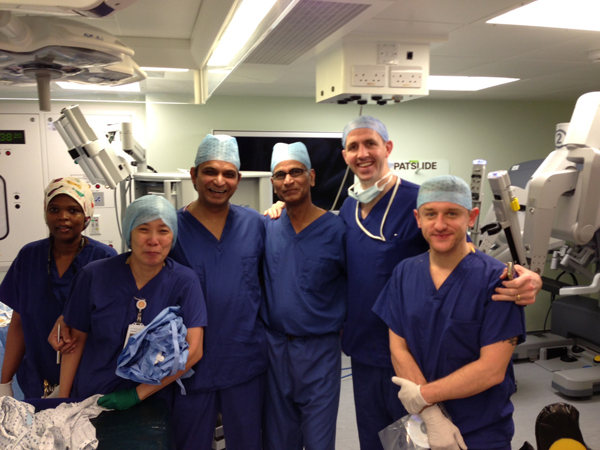 He recommended a Prostatectomy using the Da Vinci robot and recommended Professor Dasgupta to carry out the surgery. Pauls PSA has been undetectable for over l2 months until his last test a week ago where it has risen slightly. My husbands father Dr. Hugh Jolly died of bone cancer with the prostate cancer being the primary. As a result of this, and after much 'nagging', my husband had annual PSA tests, we then found it had jumped from 4 to 9.6. HE HAD NO SYMPTOMS AT ALL. If it had not been for the PSA test, we would not have known he had cancer. Thank you to Professor Kirby for 'coming out' and our eternal thanks to professor Dasgupta for carrying out Paul's operation, which has undoubtedly has saved his life. It has been encouraging to read about the latest innovations and ideas, even for a 'lay' person. Lets hope you find a new, more specific test and a cure for prostate cancer. It is so emotionally and physically distressing, not only for the patient but for their wives too. It is very difficult to talk about such personal subjects. I also wonder if patients will be given more information on exercise and nutrition in the future, I am lucky that I can access this information on the internet, but I think a lot of patients will not be so fortunate. I see from The Kenfield trial published in the Journal of Clinical Oncology shows that exercise for more than three hours a week reduces the risk of prostate cancer recurrence by 36 per cent. The survey also shows that the 58 per cent of men who were overweight had worse toxicity and risk of relapse following treatment than those who maintained a healthy weight and active regime. I have changed our diet and I encourage my husband to go the gym and he has just purchased a bicycle. This is all quite a challenge and it would really help if there were specific guidelines on nutrition and exercise given to the male patients when they attend clinic. I would value your thoughts on this.